It is a great privilege to see and walk in the places where Jesus walked. I am so thankful to God to be alive to Praise him for my healing from cancer. 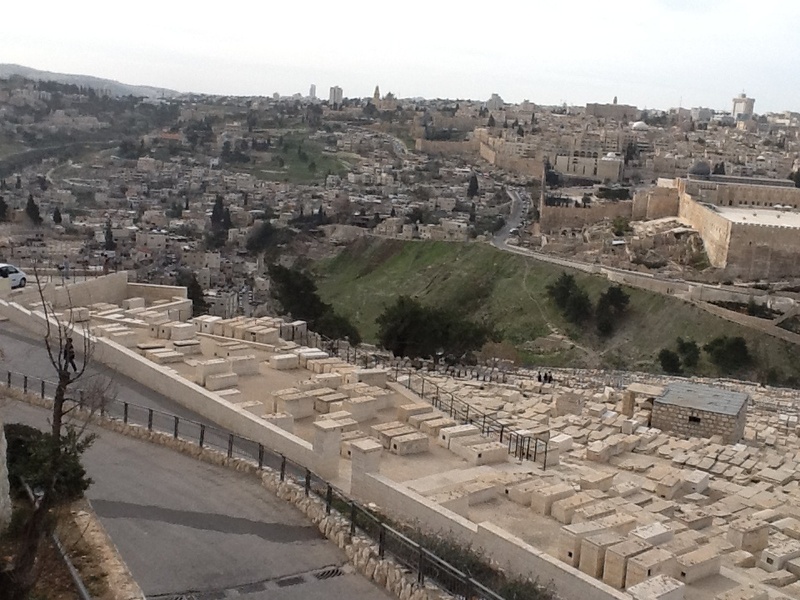 One the first day of our visit to Jerusalem we went to the Mount of Olives. From there we had a panorama of the ancient walls of Jerusalem in the distance, the Temple Mount, the Kidron Valley, the Garden of Gethseme, and the City of David to the left. In the distance we could see Bethlehem. near where the Messiah will return. The last three days of Jesus life was spent in the area we could see before us. Jesus entered the City of Jerusalem. People welcomed him by waving palm branches and cried “Hosanna to the Son Of David.” He chased the money changers out of the Temple. The Temple is not there now but we could see the Temple Mount. The Temple was built on Mount Horeb where Abraham was going to sacrifice his son. 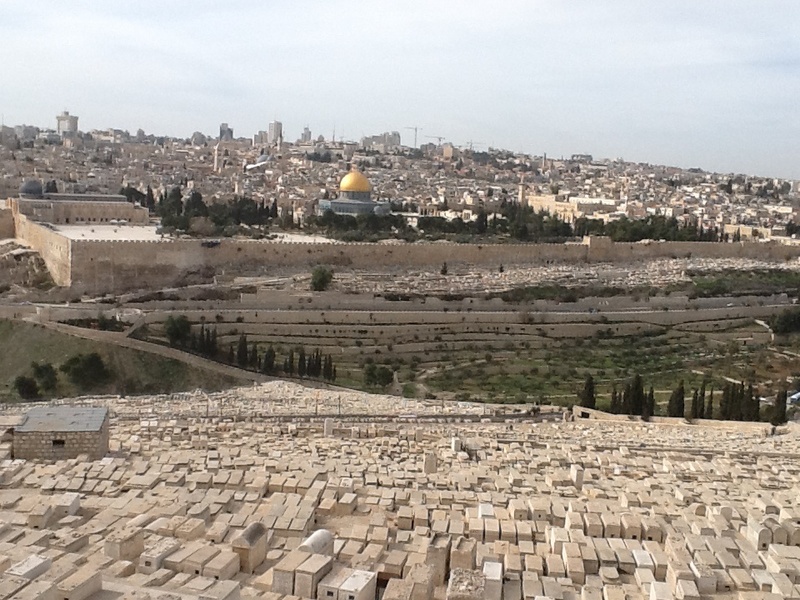 Here you have a clear view of the City Walls and the Temple Mount with the Dome of the Rock. Gethsemene is below to the right. 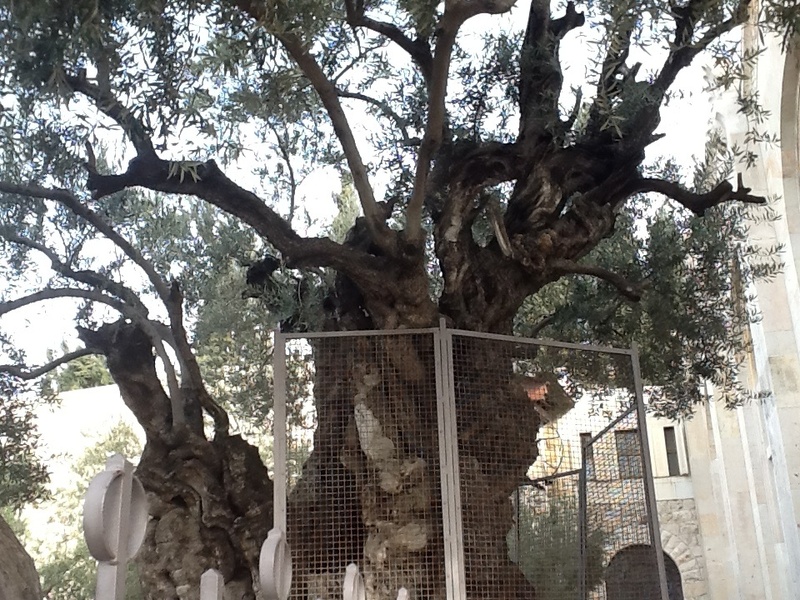 This Olive tree is the oldest in the Garden of Gethsemene. Beyond the city walls to the left it is thought to be Golgotha, where Jesus was crucified outside the city walls. There Jesus suffered and died for us. His blood flowed on the ground like the blood that flowed from the bulls sacrificed on the altar in the Temple. He became the sacrifice to God for our sins and sicknesses. He destroyed the Power of Satan. So we do not have to live under his oppression. 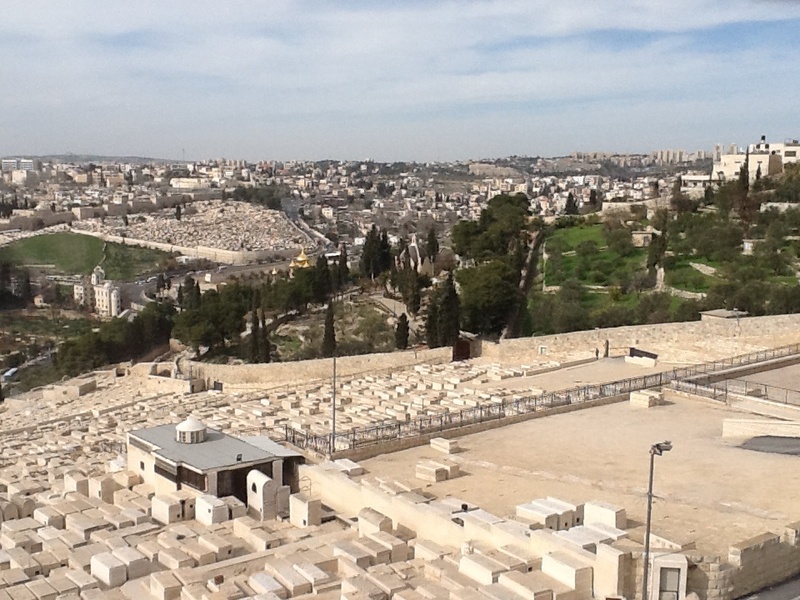 In the distance is Golgotha, to the right is Rachel’s Tomb and Bethany, where Jesus friends lived. Jesus rose from the grave and appeared to His disciples. He finally rose into heaven from Bethany near the Mount of Olives. There is no other empty grave in the world. Love is when someone thinks of the other person before himself. Jesus loved us and gave his life for us by his death on the Cross. I like & love that phrase: “there is no other empty grave in the world”!!! Isn’t that the nugget!!! The kernel!!! The “golden egg”!! The awesome fact!!!! As well as the fact that He took away our sin!!! And our sicknesses!!! And our oppression!!! And all negativity!!! Jesus is not just an amazing Mr. Positive but is Divinity Incarnate, undefeated, everlasting Spirit!! And His resources are ours!!!! Amazing!!! Thanks for the reminder Angela. Glad you’re enjoying your trip.